I love soup. There is something very comforting about sitting down with a nice hot bowl of great homemade soup. Growing-up my mother made a ton of soup. As I have talked about before we never had a lot of money so my mother did the most with what we had. We were always getting garden vegetables from friends and my mother would make delicious soup from them. While most kids would turn up their noises at turnips and parsnips, I feel in love with these root vegetables. My mother could turn a hated vegetable into something spectacular. A basic great soup is something to be savored. I am lucky that my two boys will pretty much try any type of food I put in front of them. I started giving them all the foods that my husband and I eat when they were still toddlers so they have never had a fear of new foods. I think this is an important way to teach your kids not to be afraid of trying new foods and new experiences in general. Recently I tried a new recipe for Creamy Turnip Soup from the December issue of Eating Well magazine, which looked like a great winter soup. This recipe has 11 ingredients. It takes a total time of 45 minutes, 30 minutes of which is active and makes 6 servings. I had no problems finding any of the ingredients at my local grocery store. The turnips sold at my grocery store don't have the greens attached so I followed the suggestion in the recipe and used spinach. I found that when I tried to use my immersion blender on this soup the turnips were not soft enough. They needed to either by sliced much thinner or cooked longer than the time suggested. 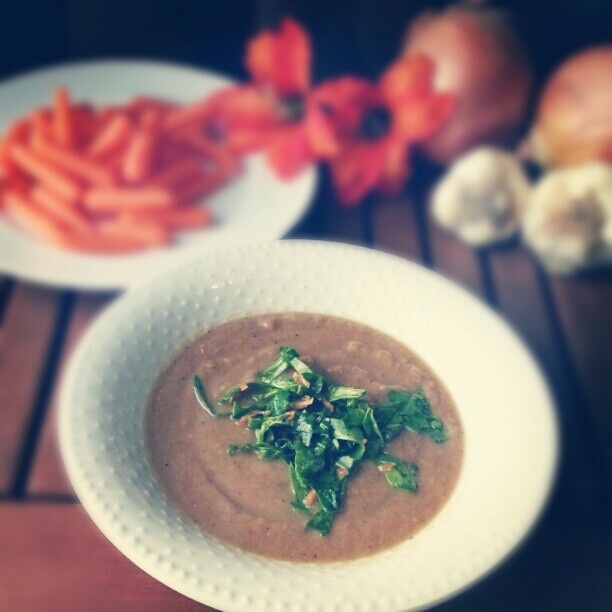 I let my turnips cook ten minutes more and then used my blender to puree the soup fully. This methods worked much better. I followed the remainder of the recipe as written. I loved how creamy this soup turned out. The salad topping was the best part of the recipe. It allowed the soup to be less bitter and bring out the flavor of the turnips. Make sure to fully salt the soup at the end. It needed a good amount of salt to taste correct. If you want to make this soup vegetarian you could substitute the chicken stock for vegetable stock. I frequently substitute broths in recipes especially if I am cooking for vegetarian/vegan friends and family. For the recipe go to Creamy Turnip Soup. Hey this looks so delicious! i'm going to have to try it out! Thanks :) If you end up trying the recipe, tell me how it turns out!